On January 4th, 2015, I arrived at the Barcelona-El Prat airport where my study abroad journey began. During this Spring 2015 semester, I am studying abroad in Barcelona, Spain, a place known for its vibrant culture, architectural wonders, and great soccer. It took 3 separate flights, with a total of 15 hours of traveling time, for me to arrive in Barcelona from Louisville, but the trip was well worth it. I struggled for the first few days to cope with jet lag; however, this allowed me to partake in the famous siesta naps that Spain is known for. While many Spaniards actually don’t nap at a specific time each day, I still actively participate in the tradition, as constantly exploring Barcelona can be quite exhausting. Barcelona is home to over 1.6 million people jam-packed into a rather small area. One major difference between the United States and Europe is that Europeans build upwards, while Americans build outwards. There are no actual houses in Barcelona, only apartments stacked on top of each other, allowing for a greater number of people to live in a much smaller area in comparison to an American city with the same population. Barcelona has an amazing metro system that is extremely comprehensive in covering all of the major parts of the city, which allows for easy exploration of my new home. One of my favorite things about Barcelona is that there is a new adventure waiting around every corner. I did my best to visit all of the major areas during my first week here because I didn’t have classes to worry about yet. While this gave me a good overview of the layout of Barcelona, I was really only able to see the tip of the iceberg that is Barcelona. The city is extremely safe, with the majority of crime being non-violent pick pocketing. I have never once felt unsafe, even when walking home at night from my friends’ apartments. This semester, I am living with a host family. I have a host mother and a host brother. My host brother is 22 years old, and he is studying to be a green energy engineer at the same university where I am taking classes. I have thoroughly enjoyed living with the host family even though it does bring about some interesting challenges. They have been extremely welcoming and helpful to me since day one, and I couldn’t have asked for a better host family to spend my time in Barcelona with. I was quite worried that there would be a language barrier between my host family and me; however, that has proven to not be the case. My host brother speaks English quite well, but my host mother only speaks Spanish. I actually haven’t taken a Spanish class for three and a half years, but I remembered quite a bit, so I was able to jump right back in. My host mother is very patient with me when I do not understand what she says. In Barcelona, the people speak both traditional Castilian Spanish and Catalan Spanish, which is a dialect from the Catalonia region, which includes Barcelona and the surrounding towns. While I do not speak any Catalan, all of the locals are very accommodating and ready to speak Castilian instead. My two favorite adventures in Barcelona thus far were touring Sagrada Familia and attending an F.C. 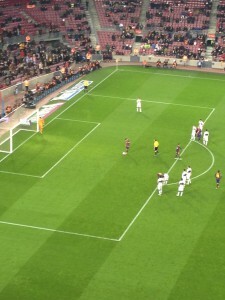 Barcelona soccer game. During my first week in Barcelona, F.C. 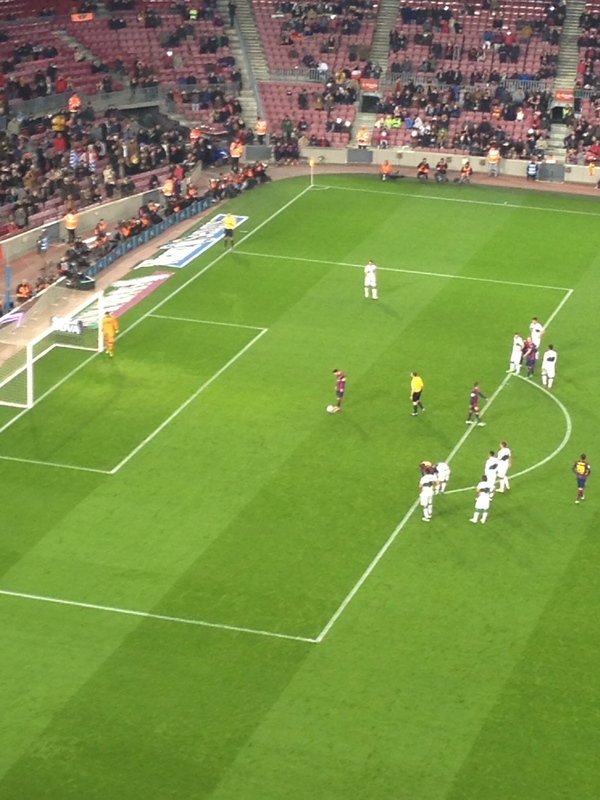 Barcelona played Elche at home. Elche isn’t doing very well this season, so the tickets were extraordinarily cheap. I got to see Messi, Neymar, and Suarez all score goals, and Barcelona beat Elche 5-0. The atmosphere was awesome, and it was very fun watching the game with some of the friends I have made thus far in Barcelona. Sagrada Familia is a beautiful church designed by Antoni Gaudi and has been under construction for 133 years. In 2010, the Pope consecrated it as a Basilica, and it was announced that Sagrada Familia will be finished in the year 2026. 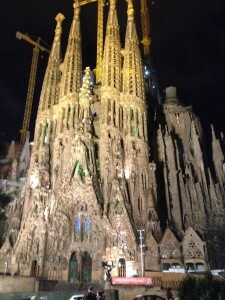 The inside is completely finished, however, so we were able to tour it and see the amazing designed of Gaudi. Sagrada Familia truly was breathtaking, and I felt like I could have wandered around it for hours. The church is so gigantic that you practically break your neck straining to look up at the top. Gaudi also designed a few other parks and houses in Barcelona that I am looking forward to visiting during these next few months here. That’s all for now! I will include information on my travels throughout Europe in my next blog post. Hasta luego! This entry was posted in Uncategorized by casmit44. Bookmark the permalink.